So you have your new hammock, or you are considering purchasing one. What next? Where should you hang it, and how can you be sure that it will be secure? There are many different methods you can utilize to hang your hammock; whether it’s between trees, from a wall, posts or on a stand. Hammocks are wonderful outdoor retreats for resting, lounging, and relaxation during the warmer months of the year If you have the space and the trees, hanging it between trees is a great choice! This method is perhaps one of the most classic techniques for hanging your hammock as that is how hammocks are most often portrayed in movies, cartoons and in the media, plus it just looks the most natural. If you choose to hang your hammock between two trees, you may be surprised to know that there are different options for hanging the hammock. 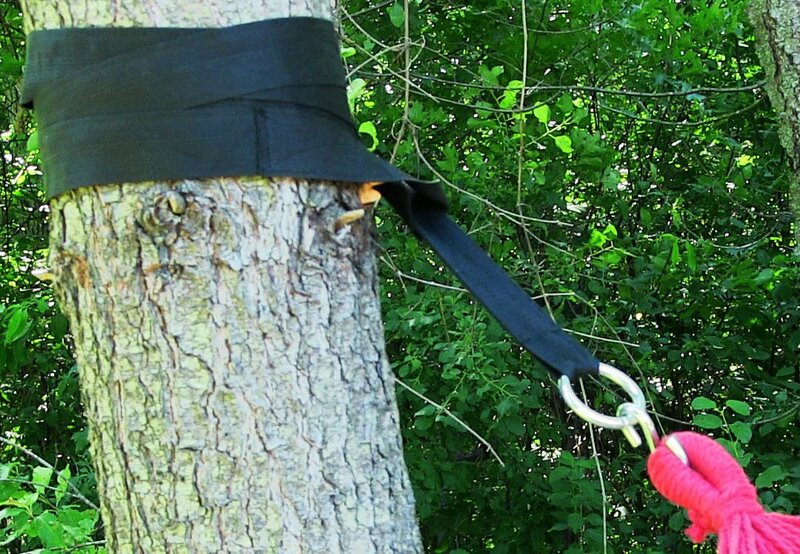 Tree straps are the perfect option for hanging your hammock on trees without harming the tree. They work by wrapping around any tree and they make it easy for you to position your hammock at the perfect height. In addition, they can be cinched and un-cinched, more easily than rope because of the zinc-plated rings for easy removal and placement. A nice, sturdy rope is another great option to tie up a hammock between trees, and because most individuals have rope readily available, it won't cost any money. 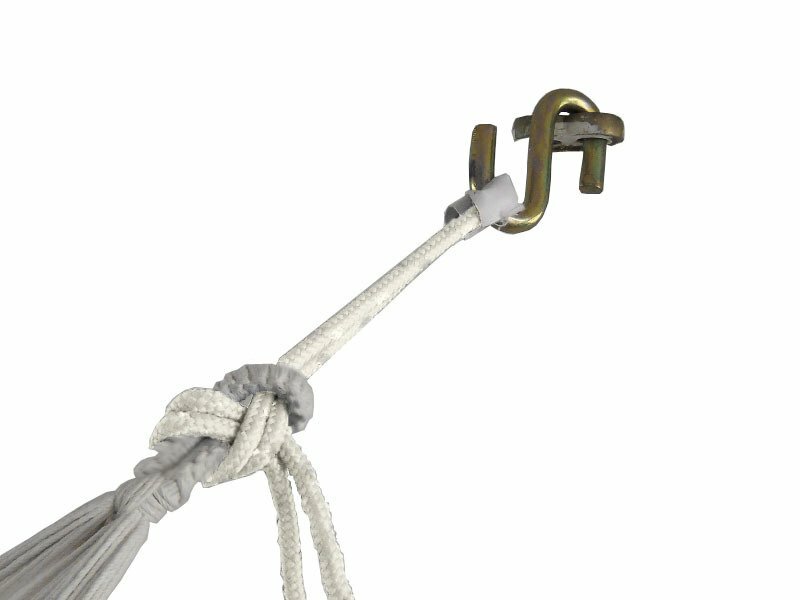 If you do not have rope on-hand, it’s not that hard to find, any hardware store should have some for you to buy. However, you do have to know how to tie secure knots to avoid falling down when trying to relax in the hammock. 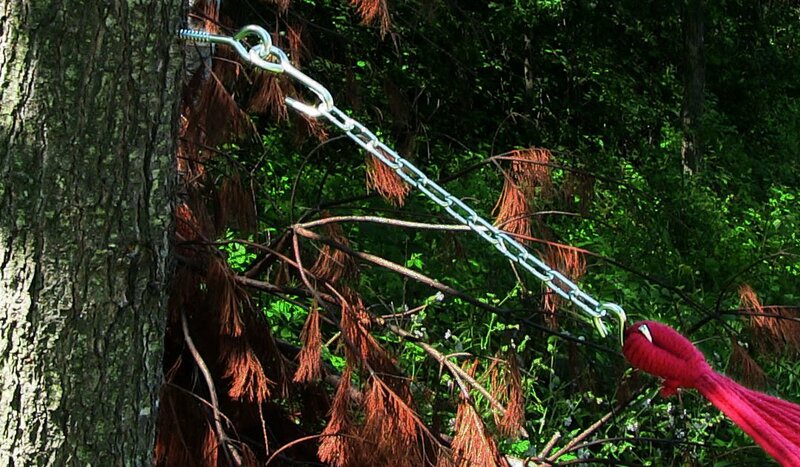 Tree hook and chain hanging kits will give you a secure place to hang your hammock. Simply drill the eye bolts into the tree, attach the chains, and add the S-hooks to hang the hammock on. Just make sure to hang the hooks at the right height because then you only have to drill once. As an added benefit, with tree hooks you will never have to worry about your hammock losing its grip on the tree and falling. 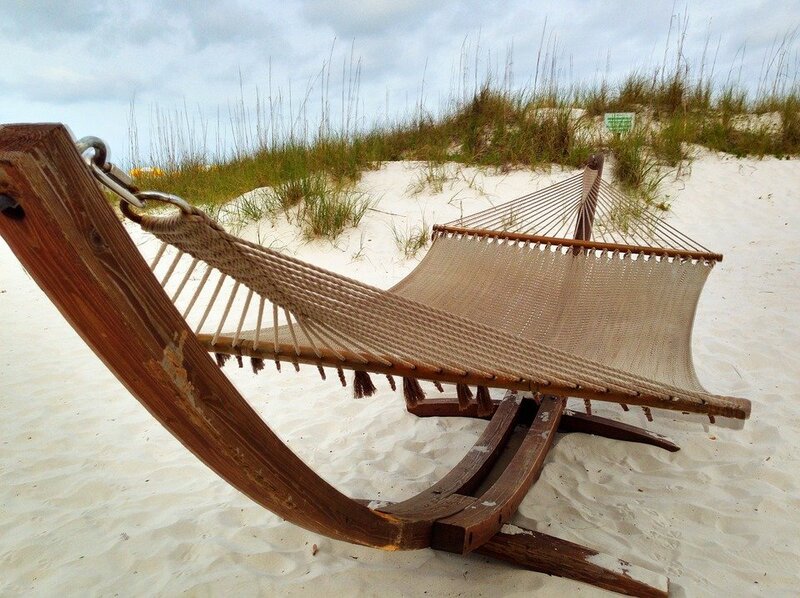 Instead, your hammock will always remain at the perfect height you choose. Since trees don’t always grow perfectly spaced to accommodate a hammock, get a little more creative and make a fun project out of it! This is a relatively easy D-I-Y project. Simply set 4 x 4-inch fence posts in a concrete mixture. The posts can be any height you desire, just make sure they are high enough so that the hammock is above the ground when you lay in it. Once the concrete is cured and posts are set place the hammock on the posts using a hanging kit. 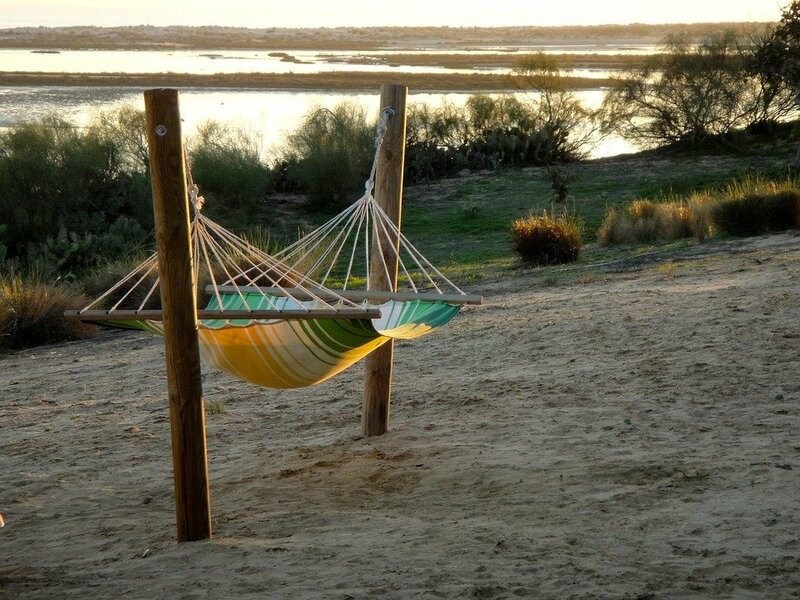 An extra advantage with using hammock posts is that it is a permanent fixture, you will not have to worry about putting the posts away. If rough weather comes, all you have to do is bring your hammock inside to store. Research how to build hammock stands, or if you are particularly handy, design a stand and use that for your new hammock. 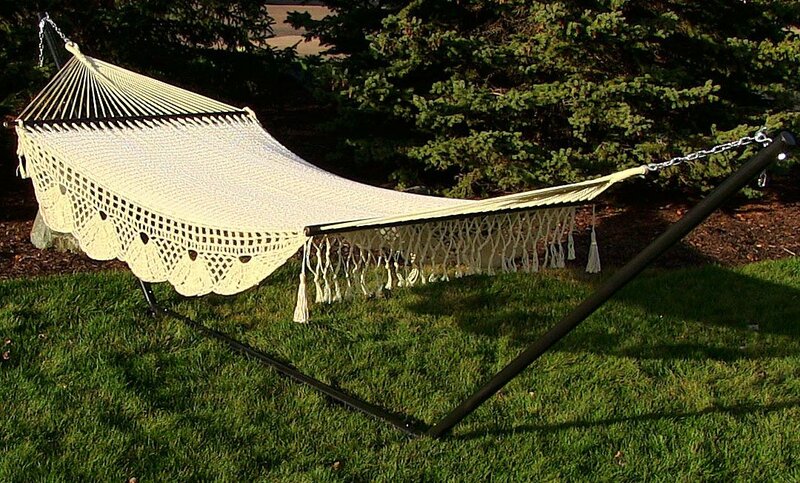 Not only will it be rewarding to build one, you get to use it to relax in your hammock once it is complete. In addition, building your own hammock stand will offer you the opportunity to make the stand as simple or intricate as you like. You can make a statement piece for your backyard patio, or you can make it portable so you can easily take it camping or to the beach. If you have an arbor, that would be a suitable location for a hammock. Simply use a hammock hanging kit on the sides of the arbor to install the hammock. Not only will it add interest and charm to the space, it will also be an inviting place for you and your family to relax and lounge. 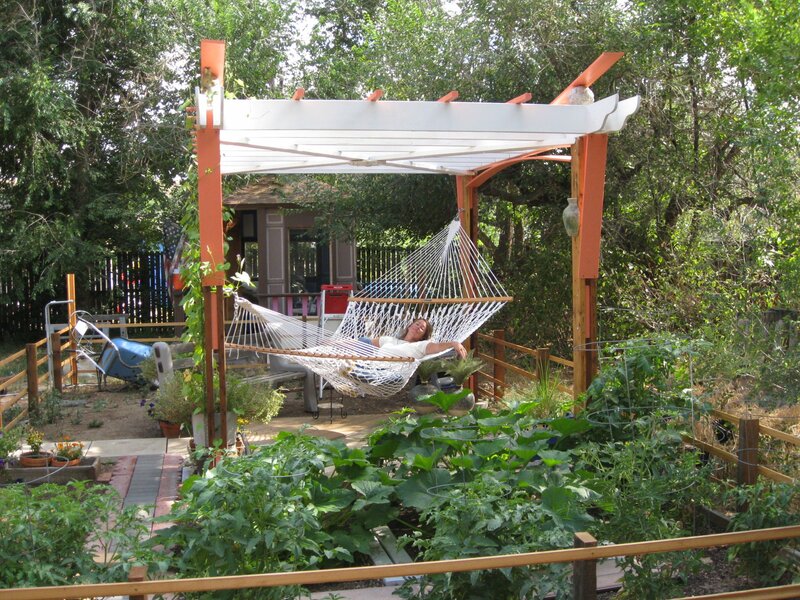 Using an arbor to hang your hammock offers many possibilities to create a restful oasis. For instance, you can plant climbing vines and flowers to gracefully scale the sides of the arbor for extra shade and elegance. The stunning landscaping project shown in the image above was designed and completed by Stuber Land Design, Inc.
Like arbors, pergolas create a perfect spot for extra plants, some flowers and greens that can sprawl up the sides of the pergola, and even continue up onto the roof. 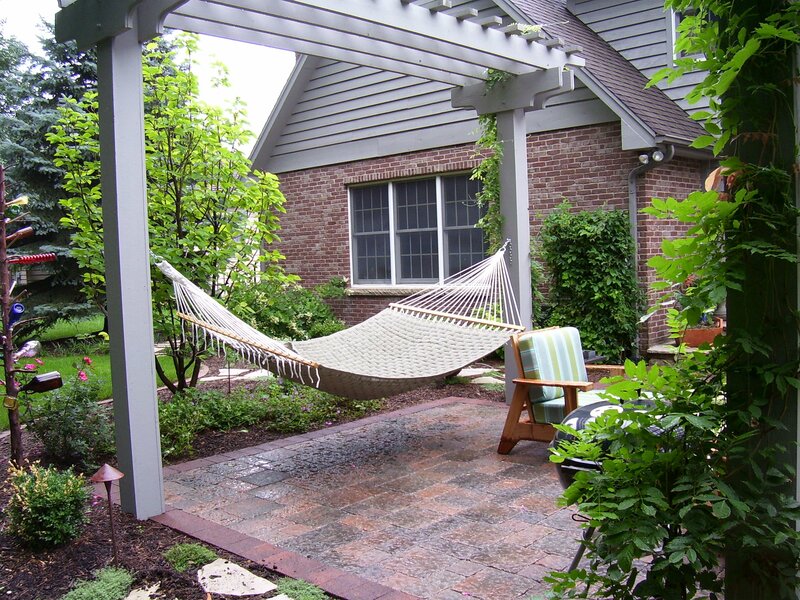 Therefore, another great idea to create a relaxing and beautiful outdoor space is to hang your hammock diagonally from the posts of a pergola. The shaded top and decorative elements of the structure will make relaxing in the hammock the highlight of your day. If you only have one tree, you can install a post across from it to fit a hammock between. This way you will get the shade from the tree without having to have two trees conveniently located to suit a hammock. Plus, the post you install can be a 4 x 4-inch post or a steel hammock post. You can even make the post a permanent fixture by using poured concrete around the base of the post; this way you do not have to worry about the post ever tipping over. A unique place that does not usually come to mind for most is between porch posts. Sturdy porch posts are a great option for hammock support that is built-in. This is a great option for you if your home is somewhat lacking in exterior space, or if you do not want to have something extra to mow around. 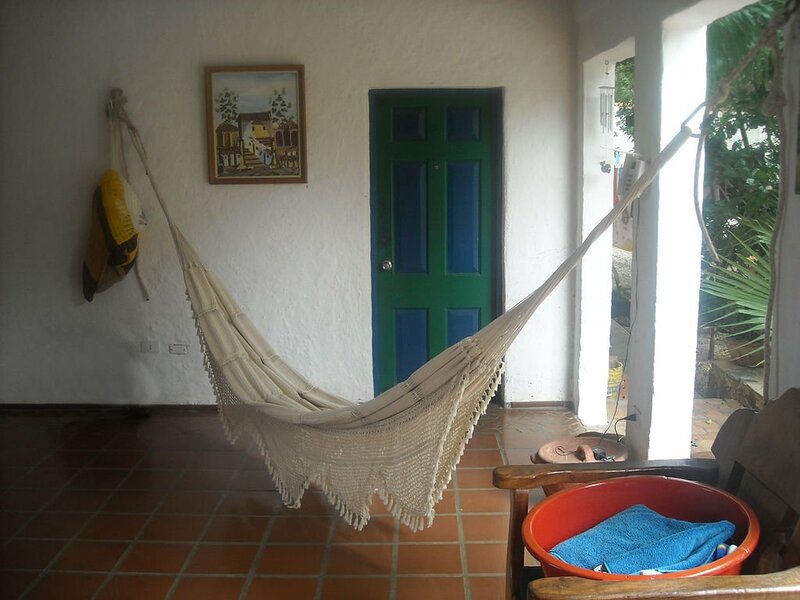 While you are hanging your hammock on the porch, make sure the distance is not more than 18 feet and the location for the hammock is safe (I.E no railing underneath that the user could fall on), you can also place your hammock diagonally in the corner of a porch. 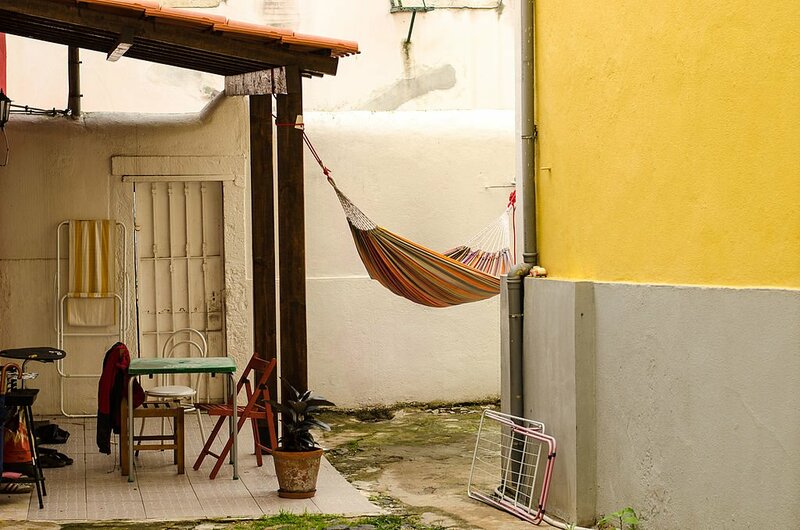 If the buildings are close enough you could hang your hammock between the house and detached garage, garage and shed or house and shed. This is also an excellent option for those who do not have a lot of outdoor lawn or yard space but would still enjoy relaxing outdoors. Just remember this would require heavy duty hooks or eye screws and they must be fastened through the siding to a wall stud as siding is not strong enough to support the weight of a person in a hammock. There’s just something extra unique about hanging a hammock indoors. It’s a great place to read or relax without having to worry about weather or bugs. You might even decide you want to try sleeping in the hammock. In that case, the ceiling or walls in your indoor space, screened-in porch, sun room, or sleeping porch is a fantastic place for hanging a hammock. To hang your hammock indoors, simply use a hammock hanging kit, eye bolts with load-bearing carabiners, or lag screws and install them into wall studs. That will ensure you have a secure hammock for resting, sleeping and relaxation. 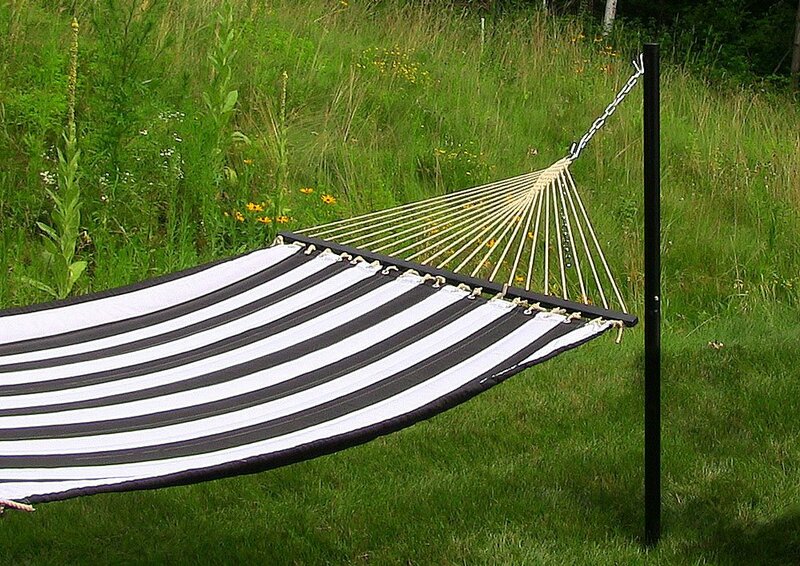 If you are searching for versatility or portability, you can always buy a hammock stand that fits your new hammock. This way, you will be able to hang your hammock anywhere you have the space. In addition, you can often choose a color that best complements your hammock. Plus, with a stand, you do not have to make anything extra or drill any holes.